you’ll be able to build your own DIY robot. Hope you enjoy the journey. Your robot chassis. 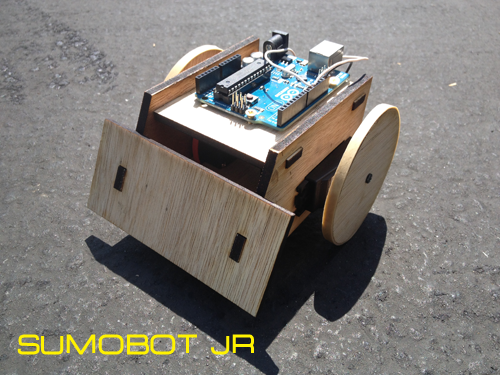 A Sumo bot Jr. is a great way to get started if you don’t have an original design. 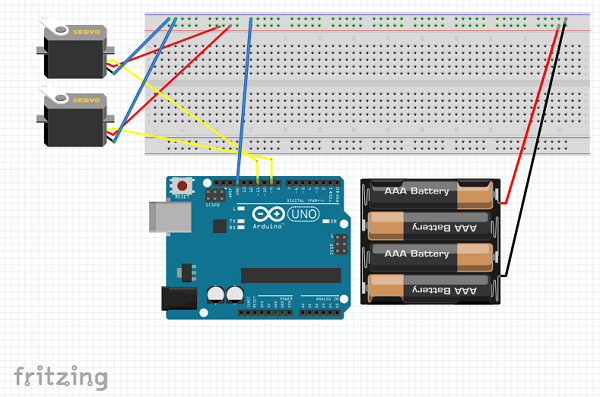 This post will focus on programming the servo’s with Arduino’s programming environment. For sample instructions on building a Sumo Bot Jr, check out the following video. In this post, we’ll assume that you have put together your robot chassis and your servos, breadboard, battery pack and Arduino have been connected to your chassis. Connect the GND pin on the Arduino to the ground line of the bread board. The ground line is marked with a blue stripe. Connect the black wires of the servos to the ground line. Connect the red wires of the servos to the voltage line of the bread board. The voltage line is marked with a red stripe. Connect the white wire of the left servo to pin 9 of the Arduino. This wire will act as a signal wire between the servo and the Arduino. Connect the white wire of the right servo to pin 10 of the Arduino. Connect the black wire of the battery pack to the ground line. Connect the red wire of the battery pack to the voltage line. Install 4 AA batteries into the battery pack. code stops the rotation of the servo. With these ideas in mind, we define the following constants for the left and right servos. We also define the constants for the Arduino digital pins. and send the stop command. The following functions are used to move the robot forward, backward, left, and right. There’s also a function to stop movement. from the serial port. If the Arduino receives a “w”, the program sends a forward command. If the Arduino receives a “s”, the program sends a backward command. If the Arduino receives a space, the program sends a stop command. In the Arduino IDE, press CTRL+SHIFT+M to open the serial port monitor. This window is used to send bytes to the Arduino. Try typing “w” and press enter. The robot should move forward. Try typing space and press enter. The robot should stop. Congrads! You’ve built your first Arduino robot!